Barring likely indictments that would take him out of the race completely, Ted Stevens is going to have a tough time this November in his Senate re-election bid against Mark Begich. Mark Begich is the mayor of Anchorage. The latest Rasmussen poll shows Stevens currently attracts 46% of the vote while Begich earns 45%. Normally, a long-serving incumbent can count on unified support from his own party while picking up some support from the opposing party. However, Stevens is supported by just 71% of GOP voters while Begich attracts 78% of Democrats. Begich leads by 22 percentage points among unaffiliated voters. Stevens is viewed favorably by 50% of the state's voters while 47% have an unfavorable opinion. Begich earns favorable reviews from 56% while just 35% have an unfavorable opinion. 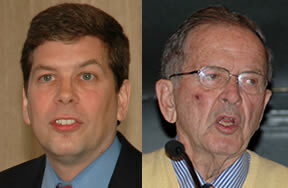 Among unaffiliated voters, Begich is viewed favorably by 66%, Stevens by 42%.